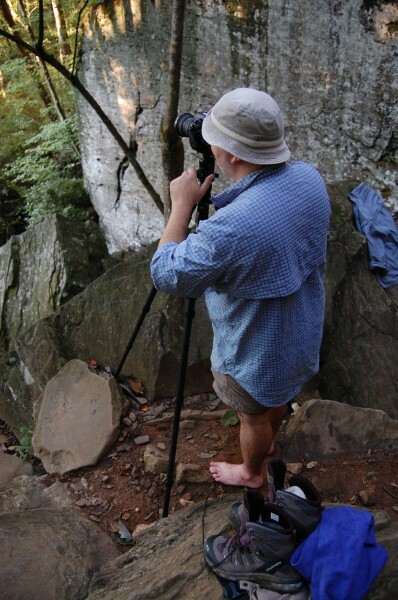 Zen and the Art of Barefoot Photography. Marcus Taylor in his element. Thank you for visiting my photoblog. I started this project to encourage myself to take more pictures and hopefully improve the quality of the photos I make. My goal for the last year has been to post one new image every weekday. I don’t always meet the goal, but it’s there to keep me creating and improving my work. It also means that sometimes I have to post shots that aren’t as good as I’d like. So if you find yourself asking, why did he post that? More than likely the answer is because I didn’t have anything better to post. I am often asked about whether I Photoshop my images. The simple answer is yes. Every single one of the images you see on my site has been edited in Adobe’s Photoshop. I shoot using a RAW file format, so every photo has to be processed outside the camera in order to create a presentable image. When I edit my photos, it is my goal to remain true to the scene as I observed it, but I have no problem with significantly manipulating an image, if I feel it produces the best artistic result. I tend to avoid creating composite images from completely different or unrelated images. When I use composites it’s almost always multiple exposures of the same shot, blended to create the best possible light. In most cases though, photos that require significant manipulation aren’t worth the effort required to save them. At any rate, it is not my intent to deceive anyone, so if you have any questions about how a photo has been processed just let me know, and I’ll respond.. Thank you for stopping by, and if you see something you like, or have a question about, please leave a comment or send me and email. I try to respond to everything that comes through the site. All photos on this site are owned by me, and may not be used without express written permission. Selected photos can be purchased as prints or at prints.marcustaylorphotography.com/fine-art. If you would like to purchase a print not available there, or to license a photo for something other than a personal print, please contact me directly.